Apple’s 2FA iCloud system is generally very diligent about securing your account, especially when you have two devices, but it has one key flaw. With an iCloud account and an Apple device, two-factor authentication is quite different than it is on any other device or account. As is the Apple way, 2FA on your iPhone or Mac is baked into the device you own, setting up a system that is theoretically as secure as a security key. Except when it’s not. Here’s how it works. When you’re trying to log into your iCloud or Apple Music account account on your iPhone, you’ll first be prompted to enter your password. Once that is recognized, you will then be asked to input a code that has been sent to one of your trusted devices, say an iPad. You’ll get a message on your iPad informing you that someone is trying to log into your account and asking whether you want to allow it. Then you’ll receive a six-digit code that you’ll enter into the boxes on your iPhone. If you don’t get the code (which happens from time to time), you can request a standard SMS code or use one of the randomly generated ones in the Settings app on your iPhone or System Preferences. Just tap on your iCloud name on the iPhone or Account Details on the Mac, then Password & Security, and Get a Verification Code. 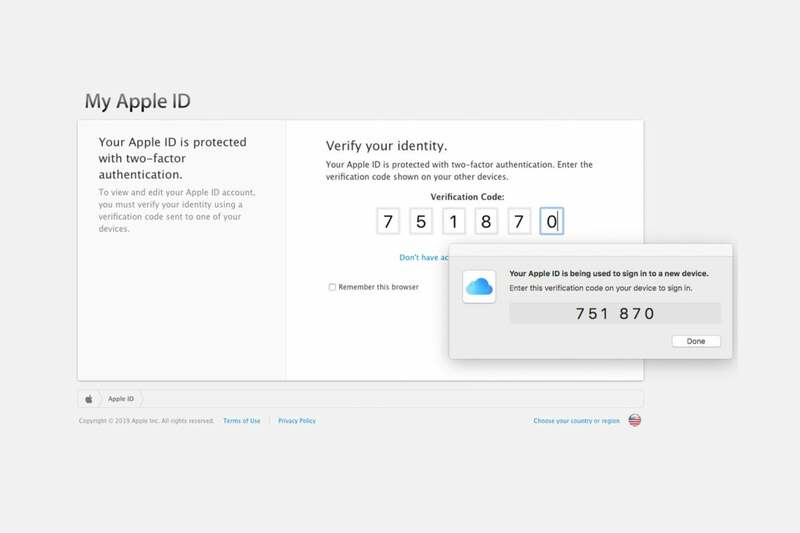 A six-digit code will appear, which can them be entered into the appropriate boxes on your other device. While it appears as though Apple has all of the 2FA bases covered, its proprietary system of trusted devices isn’t without its flaws. For one, it works best when you have more than one iOS device. Not only does it add an extra layer of protection by bringing a second device into the mix, it’s true 2FA, pairing something you know (your password) with something you have (your device). But if you only have a single Apple device, you’re kind of out of luck, and that’s where the trouble starts. If an iPhone is your only Apple device, for example, you’ll basically be stuck using SMS. Obviously you won’t be able to get a code on another Apple device, but Apple limits trusted devices to iPhone, iPad, or iPod touch with iOS 9 and later, or a Mac with OS X El Capitan and later. That means you can’t use a PC, Chromebook, or Android phone, which is a major limitation. And since you’ll be signing into iCloud in the Settings app, you won’t be able to get a verification code using the built-in authenticator tab either. When you need to log into your iCloud account using a browser, your 2FA code goes to the same device. While you’re technically protecting your account and services via 2FA, it’s the least secure way. The issues with spoofing and straight-up stealing text-based codes as they arrive are well-documented. Granted, most Android users use one of those two options on their phone as well, but at least they have the option to download an authenticator with biometric authentication. Since Apple doesn’t yet support hardware security keys for iCloud, you really have no other choice but to use a second Apple device. If the implementation of iCloud 2FA with a single Apple device is bad, however, it’s downright defective when you need to manage your account over the web. When you input your password to log into your Apple ID account page, Apple will automatically prompt you to enter a 2FA code, as it should. However, that code goes to all of your trusted devices—including the one you’re using. If you’re using Safari on your Mac, the 2FA code will pop up on the same screen, which kind of defeats the purpose and leaves your most sensitive data vulnerable if your Mac gets stolen. That means all someone would need is the password for your Mac and they would have access to your entire account, assuming you have iCloud Keychain enabled. That’s the case no matter where you log in—iPhone, Mac, PC—Apple will send your 2FA code to whomever is trying to log into your account from one of your trusted devices. I don’t know if it’s a bug or some kind of a browser-related snafu, but it makes Apple’s 2FA system more of a 1FA one.